All prices are by the cubic yard. All of the Any Waste. vans and flatbeds in our Manchester based fleet have a maximum storage capacity of ten cubic yards, meaning that we are sure to have ample space for all of your rubbish clearance needs – and the best part of all, you only end up paying for the space that you actually use! But what exactly is a cubic yard and how can you work out how much space your rubbish clearance job will be needing to take up? First of all, one cubic yard is the amount of space taken up by an object that is one yard long, one yard deep and one yard high or three feet by three feet by three feet if you prefer to use feet instead. In other words, that is roughly the same size as two standard household washing machines or the same size as a household fridge-freezer, give or take a few inches. We like to keep things simple, so try not to be too surprised if we start talking about washing machines when it comes to thinking about how much space we will need for your rubbish clearance job! Keeping things simple, we know that it can often be easier to think in terms of household objects, so the space that a standard sized sofa would usually take up for example, is approximately two and a half cubic yards – so whether you prefer to think in washing machines or sofas, this should help simplify things. 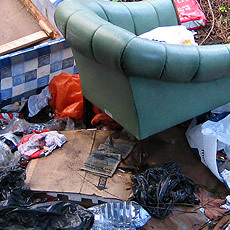 We understand that it’s not always easy to work out exactly how much space you will need, so before we start the job we make sure to confirm the exact cubic yardage of your rubbish with you when we get there, just so that you don’t end up with any nasty surprises at the end of the day! If you are still not sure or you have any questions relating to your rubbish clearance needs, feel free to get in touch with us and one of our friendly team members would be more than happy to give you a helping hand and help you to calculate how much space your rubbish clearance job will need!